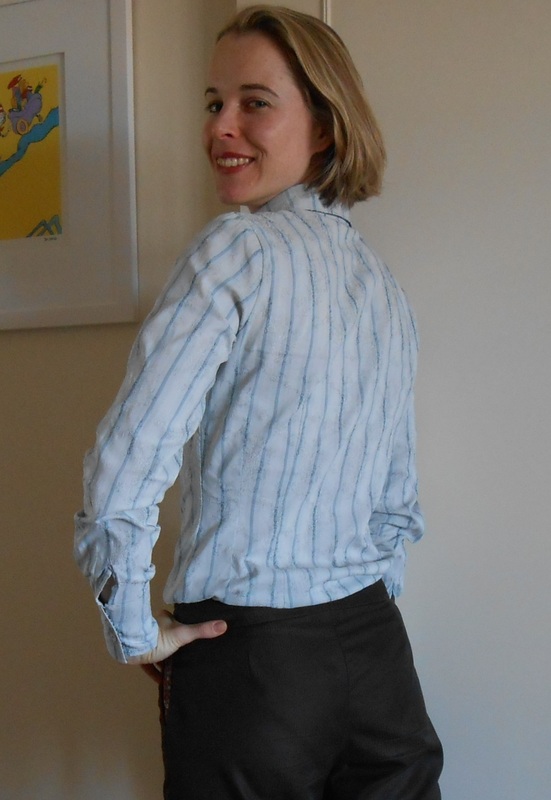 This fitted blouse was a long time in the making (and even longer time in the blogging!) and is named after my sewing buddy Lesley. The pattern is a self drafted pattern based on my fitted bodice block from my very first pattern making class at Studio Faro. But it took me a while to get my head around collars and cuffs and all the bits and pieces that go into making a button down shirt. This is where Lesley came into her own, sending me online tutorials for various parts of the shirt and tricks of the trade. We had a pattern making session together where we went through some of the more tricky bits. I don’t think I would’ve endeavoured to the end without the encouragment from a fellow sewist. I made this first version out of an Italian cotton with a little stretch from Remnant Warehouse and a contrast quilting cotton under the collar, the inner collar stand and in the cuffs. 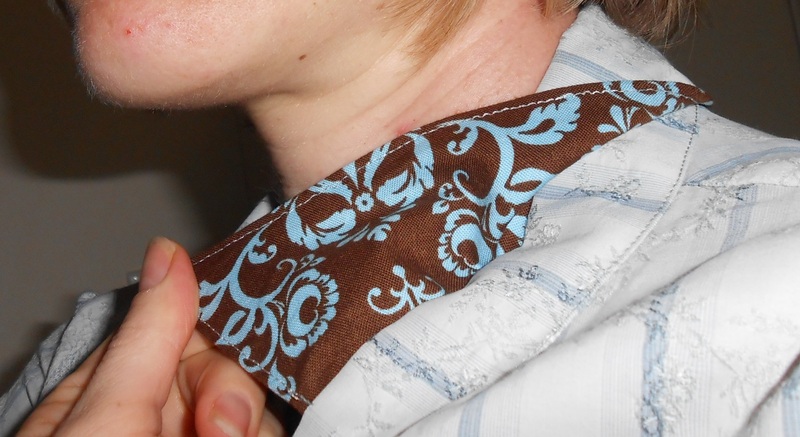 I went with a fairly standard collar, a simple button stand (just folded over section of the two front pieces rather than a separate button stand) and kept all of the waist darts as per the pattern block – that’s 4 in the front and 4 in the back! I decided on long cuffs for a more retro look but somehow miscalculated the cuff width and ended up with VERY tight cuffs. Luckily I can still do up the buttons but I can’t slip my hands through without undoing the buttons. Oops! I was considering doing sleeve plackets (Lesley had a good block for that too) but decided that I needed to keep it simple for version 1 otherwise it would never get made. 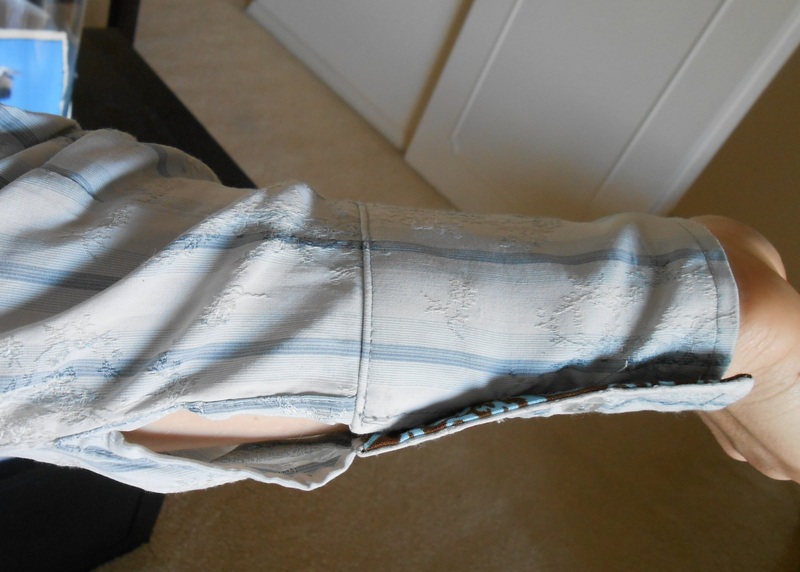 Next time I’ll have to tackle the placket. I made the shirt extra long to accommodate my long body and so that it doesn’t get untucked when I raise my arms. I like that alteration although I may need to make it wider at the bottom to get over my hips. 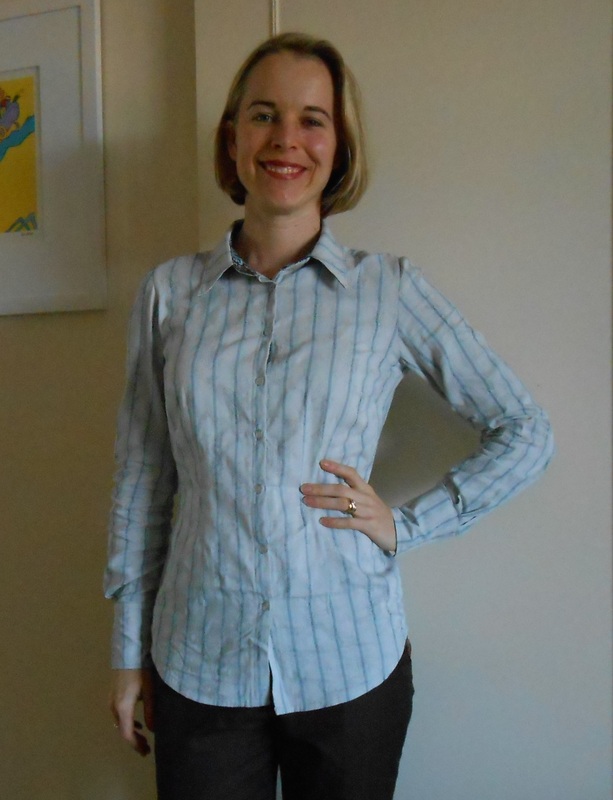 All in all, not a bad little attempt at my first blouse pattern. I’d love to make it in a fun Liberty fabric or something. But I’ll have to stay skinny to fit into it with all those unforgiving waist darts! Alterations: Specific design decisions this time was the long cuff and extra length. 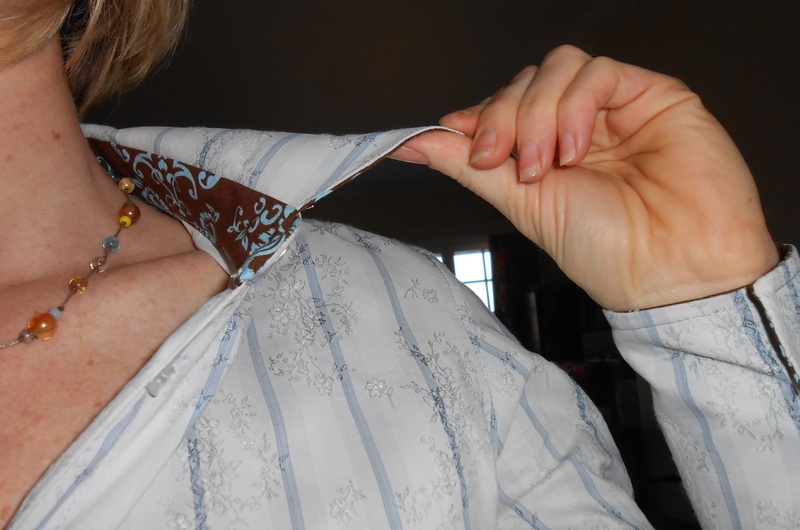 Next time I’ll stick with the extra length (wider over the hips), have short and WIDER cuffs and I might have a go at the sleeve placket. Oh Mary, I’m so flattered! 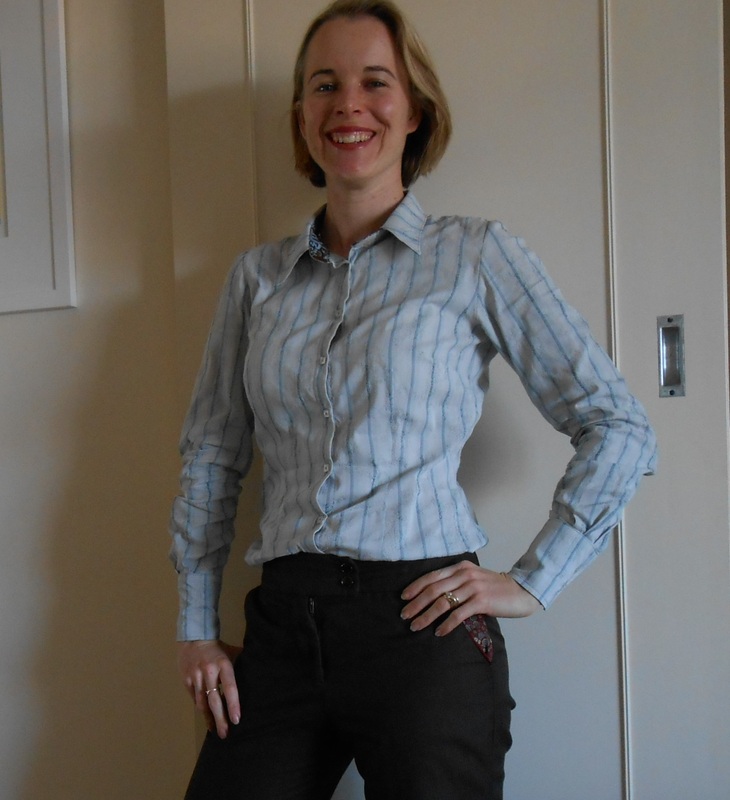 Anita helped me a lot with my shirt pattern, it fits like a glove but I think I’ve packed on some lard! Its always hard to know what is a design decision/fashion silhouette and what is a genuine fit gripe isn’t it? I can see a Liberty shirt in your future, short sleeves for summer, gathers off a yoke, pretty and whimsical like your good self! Thanks, Sue. Yes the drafting is fun and quite fulfilling when you get it right. Just takes a while 🙂 No instant fix. Great fit and the design features are cute. I’ve rendered all my Studio Faro drafting blocks useless by losing 12 kilos. Definite down side of looking and feeling better!